In our house, we pride ourselves in creating something out of nothing! We frequently re-use (or upcycle!) items commonly found throughout our home to give them a new purpose. Over the past few years, I’ve upcycled tons of furniture! More recently, my cute kiddos have been obsessed with creating upcycled ornaments for Christmas. My kids can turn anything from CDs, old cardboard strips, and even a long forgotten book into an ornament worthy of the highest spot on your tree. My kids have shown me that it’s possible to totally decorate your tree with nothing but upcycled items. 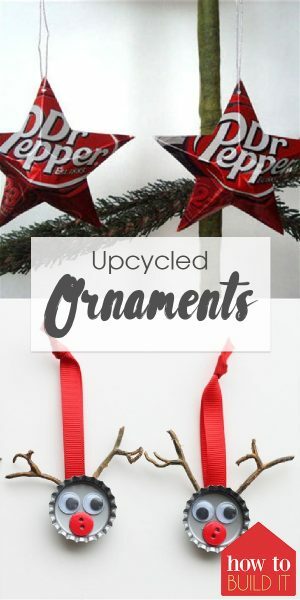 Make some for yourself with these incredible upcycled ornaments! Comment below and tell me which ones are a must-make for you! If you’re like me, you probably have tons of leftover and unused Christmas lights hanging around your house somewhere! Instead of leaving them to take up space in your garage, put them to use as Christmas cards! To create, you’ll want to dunk your lightbulbs in Mod Podge and then cover in a bit of glitter. 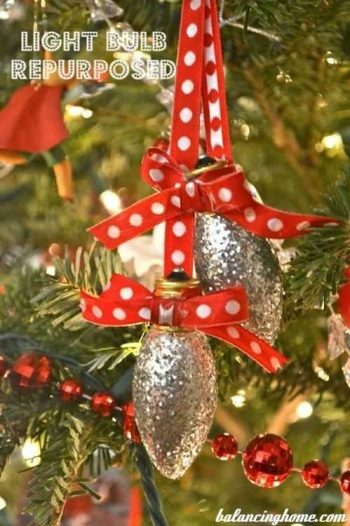 Let dry and hang from your tree with a bit of ribbon tied around the lightbulb neck. This photo was originally found on My Simple Pretty Blog.